TPC Overall Rank: #56 out of 2933 rides. Maxair is a pendulum. It is fast, fun, rerideable, it has a large capacity, and a long duration. It was built in 2005. I went on this ride when it was raining. I was scared the i would get dizzy, but you don't. It's alot of fun! Even tho the rain felt like pelets on my skin it was still scary fun. We barley waited 10 minuets to ride it but I would still ride it even if the wait was 30 minuets. LOVED this ride! It kinda reminded me of riding RipCord at Michigan's Adventure, only you're seated and the ride is actually controlled. THIS IS ONE OF MY FAVORITE RIDE AT CEDAR POINT! I agree with not having to wait in line very long but when I was in line someone got sick on the ride right before I was going to get on. So they had to clean it off and then they let the ride run about 2 or 3 times to air it out and then they let us on. I do not understand HOW ANYONEEEEEEEE can get sick on this ride. Maybe it's because of the spinning or maybe they went on a ride before this that messed up their stomach and they couldn't handle anymore ride idk.. but yeah that ride is awesome and this is coming from someone who gets sick on rides and has to take dramamine before attending any fair or amusement parks. I will tell ya that stuff works wonders! I can go on rides that go upside down and do not get sick (knock on wood lol). maXair is probably one of the best, if not the best, flat rides I've ridden in my entire life. Since it's in the 'dead' section of Cedar Point, the line was literally five minutes, so I didn't have to wait for too long. When I was boarding the ride, I wondered to myself, 'man, am I gonna puke?' Fortunately, maXair was not designed to make you dizzy. The spinning is only really for giving everyone a chance to fall at about every imaginable angle. Compared to Delirium at King's Island, this works out a lot better, as the ride cycle is actually long enough for you to fall at quite a few angles. Personally, I preferred falling backwards because I couldn't see where I was going. But no matter which way you fall, a Huss Frisbee is always worth riding. 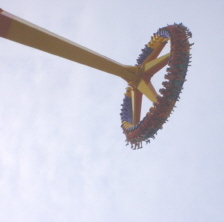 The sheer size of this ride is intimidating, but after mustering up the courage (i.e. 2 beers, reckless perhaps) to hop aboard, I found this to be a gentle giant. I thought this would be like a Frisbee (Tomahawk at SFNE) on steroids, and perhaps in a way it was - big, but only in an inflated, artificial way. There were no significant G-forces, and the revolutions seemed to come to a near stop at the apex of the swing. This ride is like kissing your sister; nice enough, but nothing you should get excited over. I loved it. Even though, I wish they&#39.d stop it sooner, when its just kind of spinning you real slow at the end lol.. still a great ride. MaXair was an extraordinary flat and my favorite frisbee ride out there. First off, this one had an incredible capacity which meant it had almost no line. The ride itself was incredible and quite a rush. Many of the swings provided excellent air-time and the Gs the swing pulled were unbelievable. Along with the intensity, MaXair provided some great views of Lake Erie. The cycle was also good too.